The Black Magic High Contrast Liquid Photo Emulsion Kit from Rollei is a gelatin that contains silver halide crystals, which make the emulsion light sensitive. This emulsion can be applied to many materials like paper, canvas, wood, glass, and metallic surfaces. The bonding process of the emulsion improves when the gelatin additive is brushed onto the surface as a primer, which also acts as an isolator for metallic surfaces. Once the emulsion dries, it becomes a fixed grade 3, high-contrast emulsion. Meanwhile, exposing the negative and the emulsion together with short exposures of light is then developed with RPN Print Neutral developer. As a result, it produces black cold tones with high edge sharpness on the material. 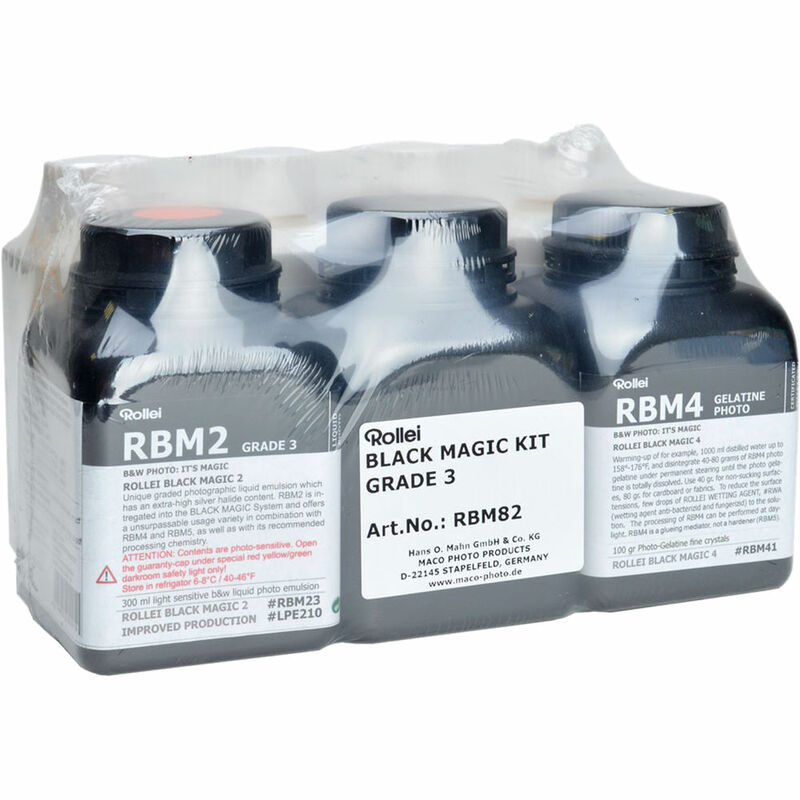 A combination of RCS Citrin stop bath and RBM5 hardener, which makes the emulsion stronger and scratch-resistant, stops the development of the image. Thus, the image is made permanent on the material when RXN Fix Neutral is used. Box Dimensions (LxWxH) 6.7 x 5.5 x 5.3"